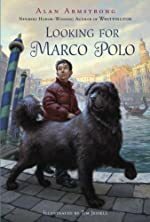 I guess you really can't jugde a book by it's cover, at first glance the book Looking for Marco Polo is a bit childish, but Sheila your review proved to me that even if a book looks childish it doesn't mean that its a bad book. If fact looking at the ratings of people who have read this and it's a five so obviously this book is captivating, informative, and generally a great book. Excellent job Sheila!